Hotel Touring is nestled in the beautiful mountain scenery of the Dolomites, UNESCO World Heritage, in the center of St. Christina in Gröden. It is a wellness oasis where unplug and recharge your batteries during your holidays in South Tyrol. The convenient location of our hotel makes it an ideal starting point for skiers in the winter season! The cable car of Monte Pana and Sasslong are a few hundred meters away and the ski bus stop is just 50 meters far.You can ski on the slopes of the ski resort of the Dolomiti Superski, Seiser Alm and Sellaronda. In summer, our guests can enjoy hiking, cycling , horseback riding and much more. Not far from our hotel you can find also shops, restaurants, bars and ski schools. It is more than 25 years that our family takes care of its guests. You can choose to stay in a Junior Suite, Comfort or Standard rooms, all furnished with care and with the most modern comforts. Our wellness area offers a Finnish sauna , Turkish bath, bio sauna, whirlpool, revitalizing shower and ice fountain and a tranquil relaxation area. Ideally, after a challenging hike or a day of skiing! We look forward to having you soon as our guests! Classic 80s room (22 m² to 24 m²) with shower, WC, bidet, hair dryer, desk, satellite LCD TV, telephone, free WIFI, safe. Room with double bed or twin beds, possibility of adding a third bed on the professional couch with mattress in some rooms. Non smoking room. Comfort Room (18 m² to 21 m²) with shower, WC, vanity mirror, hairdryer, desk, TV-LCD-TV, telephone, free WIFI, safe. Room with double bed or twin beds. Non smoking room. New Superior room (20 m² to 30 m²) with shower or bath, WC, bidet, vanity mirror, hairdryer, desk, TV-LCD-TV, telephone, free WIFI, safe. Unique room with various availability of adding third beds on professional sofas with mattresses. Balconies available upon request and availability at reservation. Non smoking room. Single Room (from 13 m² to 16 m²) with shower, WC, bidet, hair dryer, desk, satellite LCD TV, telephone, free WIFI, safe. Non smoking room. Junior Suite (25 m² to 28 m²) with shower or bath, WC, bidet, vanity mirror, hairdryer, desk, TV-LCD-TV, telephone, free WIFI, safe. Unique room of 30m² with double bed and additional possibility of adding a double bed on the professional couch with mattress. Family room (42 m²) shower and separate toilet, bidet, vanity mirror, hairdryer, desk, TV-LCD-TV, telephone, free WIFI, safe. The Family Suite comprises a bedroom of 25m² with the possibility of adding a double bed on the couch and a professional children's room 13m² with two bunk beds. Min 2 max 6 people. Non smoking room. 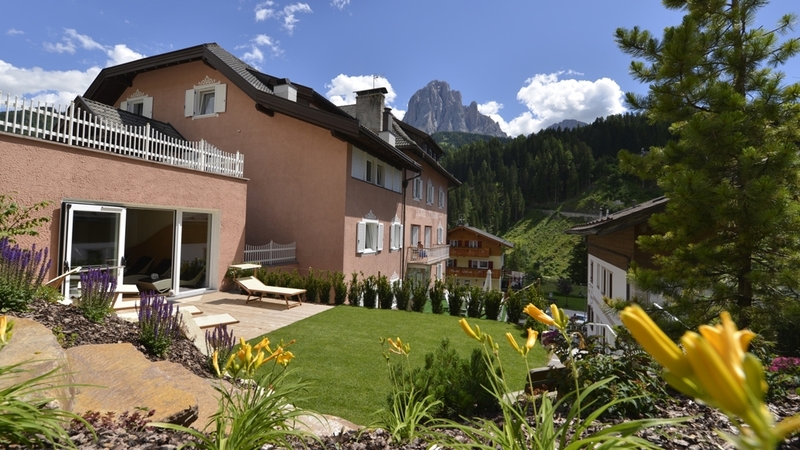 7=6 "Val Gardena Spring offer"
Kids weeks in Val Gardena! Children are free until 8 years and have 50% discount until 12! Get your special offer!